The Tab M10 with Smart Dock from Lenovo is designed to support your productivity and entertainment needs while you're on-the-go. It comes equipped with a 1.8 GHz Qualcomm Snapdragon 450 octa-core processor, 3GB of soldered RAM, and 32GB of eMCP storage. In terms of visuals, the Tab M10 sports a 10.1" Full HD 1920 x 1200 IPS display that is powered by an integrated Qualcomm Adreno 506 Graphics chipset. Moreover, the Tab M10 houses a 2.0 MP front camera and 5.0 MP rear camera for all your photographing. This tablet utilizes USB 2.0 Type-C connectivity, two Pogo pin ports, a hybrid microSD-SIM card slot reader, and a single audio combo jack. Furthermore, the Tab M10 can connect to the internet or wireless peripherals through Wi-Fi 4 (802.11b/g/n) and Bluetooth 4.2. Additionally, this tablet has a battery that can support up to eight hours of video playback. Lenovo includes the Smart Dock to hold up the Tab M10. The operating system is Android Oreo. The Tab M10's 10.1" FHD display captures everything from the intensity of an action scene to the beautiful details in family photos. At just 8.1mm thin and 480g, the Tab M10 fits easily into a satchel or backpack since it's built to be taken anywhere without weighing you down. 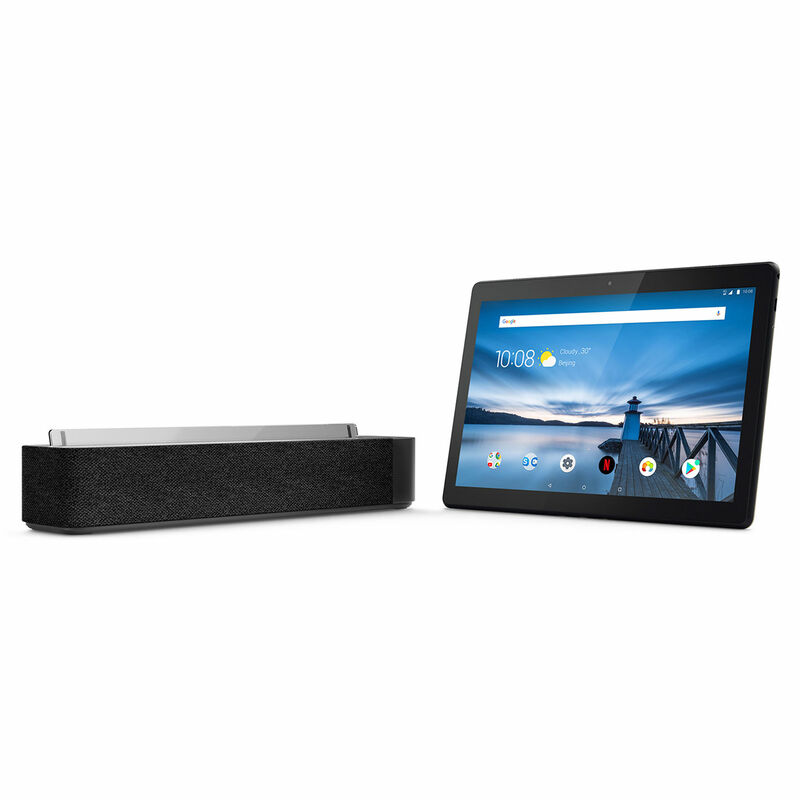 Immerse yourself in booming sound when you listen to music, movies, shows, and videos with this tablet's dual front speakers that offer Dolby Atmos support, which means you can enjoy theater-like audio wherever you go. Add in the optional Kid's Pack to keep your children and your device safe thanks to its custom shock-resistant bumper along with a special mode that feature up-to-date and curated content for children. Box Dimensions (LxWxH) 12.0 x 8.3 x 2.9"
10.1" Tab M10 with Smart Dock is rated 3.5 out of 5 by 6.